Kubota Tractor Australia recently released the new U15-3HG, 1.5 tonne zero tail swing mini excavator to the Australian market and it did not take long for the first unit to be retailed. 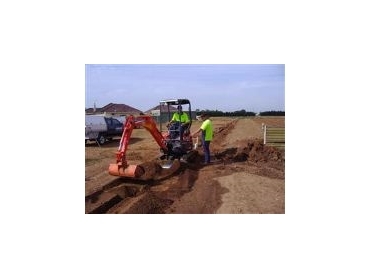 Brad Taylor of Taylor Irrigation, Werribee, Victoria was in the market for a new 1.5 tonne mini excavator and on seeing the U15-3HG at the recently held National Construction Expo, decided this was the right machine for his business. Brad was impressed with the variable tracks feature as it allows him access to small residential backyards, as well as the various width seedling beds of his horticultural customers without causing crop damage. Brad’s operator, Claude Ornelis, was very impressed with the machine’s digging ability and stability. Claude explained he had hit a 50mm tree root whilst trenching, however with the 1550kg/f bucket breakout force, the U15-3 broke through the tree root with minimal effort. When precise work was required along side a foundation, the U15-3, with the boom ram cleverly positioned on the back of the boom, enabled Claude to concentrate on the digging job without worrying about striking the boom cylinder with the bucket teeth or hitting the wall with the rear of the machine. As the U15-3 is predominately used for digging channels, the excellent ground reach of 3840mm allows Claude to dig a longer trench with less moves of the machine, increasing productivity. The U15-3 comes standard with a 4 post certified ROPS/FOPS canopy and a suspension seat with arm rests for superior operator comfort. With a three-year warranty offered as standard, Brad has total peace of mind his U15-3 will not let him down. Brad purchased his U15-3 from Supergroups in Hallam Victoria.